Am I really going to have to light Mr Stove in August? 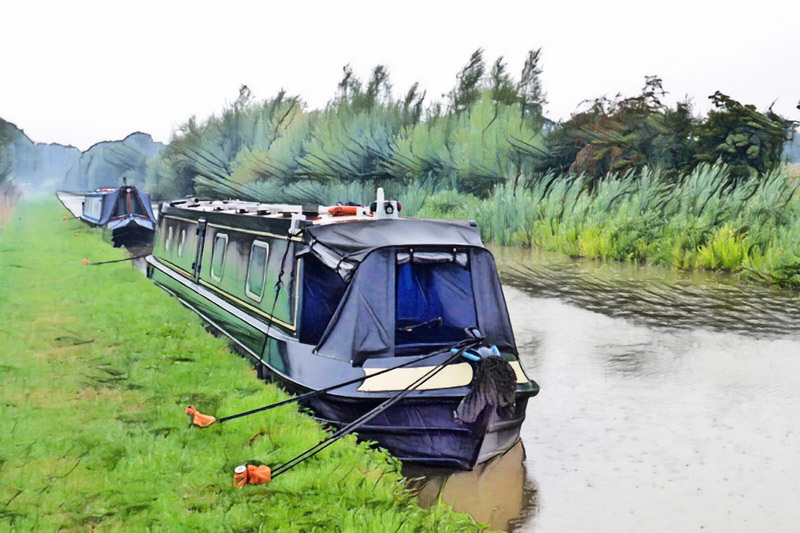 #narrowboat #england – The Diesel-Electric Elephant Company. Ye gods but the seasons have slipped! Bloody England, one extreme to the other with no rhyme or reason. I do think that Hooman Beans have changed and are still changing the climate, but I think that the climate is also changing itself, even more so. Some sort of cyclic arrangement of the sort that froze the Thames solid all of those times between 1600 and 1800. Humans and the caprice of Father Nature, together we’re a dangerous combination. Among many other jobs I have sorted out the winter gear today – hats, gloves, scarves, buttock-warmers and wotnots. Doubtless we’ll be baking again in September. We’re moored on dodgy pins at the moment (no armco) almost at the far distant end of this line. I can’t light the stove, that would be silly – it’s ruddy August! Maybe I’ll spend a wee dram o’diesel later and fire up the central heating instead? Perhaps I’ll bake bread and put my feet up on the oven door. It has been unfeasibly dull here today too – it’s not really bothered to get fully daylight at all. The Cardinal’s solar panels have worked wonders, not only running pumps, lights, stereo and things but also catching up with my over-night use last night too. Magic. The wind has volte-faced. Where yesterday the gusts were tickling our derriere today they are flapping the canvas of the cratch cover on the bow. The rain, though, has continued to fall from on high to everything on low. At least Ingerlund is looking green again, and not that Serengeti parched-corn colour. It has just occurred to my sloth-like, addled brain – this is a Bank Holiday weekend, isn’t it? That’s why the weather is so ruddy dismal! Good grief, if slow was actually fast then I’d be the quickest thing on three wheels. It’s all good fun anyway, whatever the season. My insulated little fingers are bashing away at “Project X” at the moment. I have a couple of kind folk test-driving Cheerio, and thanks for the apocalypse for me, and as soon as the dust has settled and the blood’s been mopped up I’ll set the publishing in motion for a few weeks hence. There has been very little wildlife about in the past few days. Too ruddy cold and wet, methinks. The local moorhen has taken to nibbling at the grass on the towpath alongside the Cardinal, which is very brave indeed. The only ducks that I have seen have all been on a mission, paddling like Mississippi steamboats from one horizon to another either in an effort to keep warm or to find the Sun, or both. I can hear a boat approaching from our stern, it is about the sixth or seventh to pass today. Not many people about, either. This one has an elderly collie dog sitting on the roof. He has that look about him of “why the hell didn’t I put my doggy longjohns on this morning?” Aha, they’re mooring up just ahead of the boat in front. Presumably the dog’s had enough and wants his tin of Dog-e-Nosh and an evening in front of the telly. Just to make me out a liar four ducks have just flown past at low altitude. Mind you, they were all wearing pop-socks and crocheted willy-warmers. Probably off to the nearest Travelodge for a night in a hot bath. Oh, Ms Just-Mooring-Up-Ahead has stepped out and off their boat. She’s wearing shocking pink lycra-thingies on her legs and a yellow hi-vis jacket. She’s the brightest thing that Cheshire has seen all day. Note to self: Stop being such a nebby bugger, go put some food on and then get some more writing done. if you work for a couple of hours I’ll let you watch a DVD later. Damn, I’m good to myself. You have to be, in winter. I mean August. In August. It is August, isn’t it? It was 32C today in Toronto but with the humidity it felt more like 38C – just over 100F – and we have all pretty well had enough of Summer. I would kill for a couple of lovely cool days! And yes, whenever I head to the UK I go prepared for pretty much anything. I was there for 6 weeks in the summer of 1976 and saw rain once – and then again we were in Edinburgh one August and it was so cold that my parents had to go out and buy anoraks for the 3 youngest as they didn’t have anything warm enough with them – and it was freezing! Hope it brightens up a bit for you. Seventy-six was a record-breaker, longest, hottest, dryest and all of that sort of thing. I didn’t seem to mind it so much when I was younger, and I was so very, very young then! I was under the impression that mid 50s was the norm for August in England. That’s why you all never install air conditioning. We have been having some exceptionally pleasant weather here, for the last week. But it is all relative. It’s been middling 80s F. For us that’s perfect summer weather. But we also think AC is the one of the essential requirements of life just after water but before bread. So much in life is all about your reference point and your resources to manage. We don’t have domestic air-con for much the same reasons that we don’t have snow tyres for our cars – England’s all extremes, mixed up and for very short periods. Snow tyres would die of old age in the garage, waiting for the once-in-a-blue-moon use, and the air-con would just rust for eleven months of the year! 🙂 It’s a standing joke that we’re never prepared for the weather, but then with the exception of the recent very extraordinary heatwave, it’s never predictable… This is a country full of locals all carrying or wearing, or wearing AND carrying, the most inappropriate clothing options, just in case. We bumble along quite nicely though. Fancy forgetting it was Bank Holiday weekend. I expected you to find some backwater hideaway until the weekend crowd have passed by. You make a rainy Sunday sound so nice, home baked bread and the threat of a hot stove and marmite (yuck!) or melted cheese or grapefruit marmalade – whatever it is its got to be comfort food! Keep warm it’s brighter tomorrow and watch your stern in the rush! Decisions, decisions, I’m in a mobile home and I refuse to plut the orange fired glow bars in the corner so I know what you mean. Be sure it’s only temporary, the weather or non-use of fire, you choose the answer. My mother taught me that the secret to a good hot-water bottle is to fill it with hot toddy, and to always have more than one bottle… 😉 It really is autumn with a vengeance, what peculiar weather! My Mother was a Baptist, no alcohol for us! I do suspect though that it was more the fact that there was no money to spend on it. I have made up for the lack now!